Jamming in the ‘rock room’ and waving its musical flag wide and high is yet another stellar Fall 1973 Grateful Dead performance. 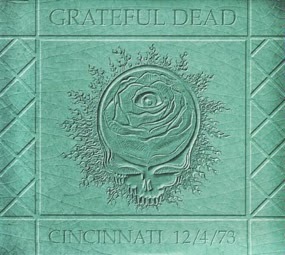 Today I am enjoying the bonus disc included in the Grateful Dead Winterland 1973 complete recordings box set. The performance hails from December 4th, 1973 and is nestled snugly in the midst of a series of amazing live concerts put on the group. Surrounded by the Boston Music Hall performances (11/30-12/2) and the December 6th lift off in Cleveland (all immortalized by official releases) this particular night is branded with the same quality as the concerts that surround it. 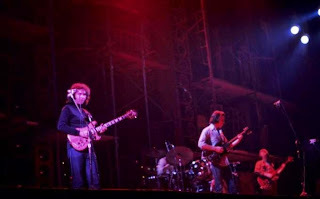 The music from the night featured in today’s ‘Now Playing’ is unique because according to legend the Grateful Dead were supposed to appear at 8:00 and didn’t end up taking the stage until 11:00 PM. Travel issues and stage schematics are believed to be the cause of the tardiness. The usual three hour concert extravaganzas which were the norm from this tour did not take place on this evening because of the aforementioned late start. I can state for certain that the Dead made up for any crowd disappointment by dealing a hand made up of spades. The music available here and on bootleg, is still consistent with the usual quality from the Fall tour, yet swings with a stoned party attitude that sits just outside of the lines. The late evening probably resulted in more social time than usual for the boys, but that never bother them before now did it? Special circumstances usually resulted in special shows for the band, while ‘big’ shows were famously underwhelming. 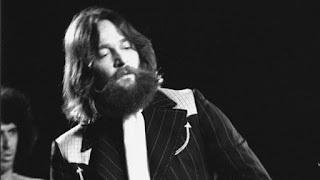 While the bonus disc that was included with the official Winterland release features the ‘best’ moments of the concert, a soundboard recording of the entire evening in available for those who want to experience it. The first set does contain some other moments of note like a rare ‘Johnny B Goode’ opener. The bonus disc begins with a tight reading of a mid-first set ‘China Cat Sunflower’/’I Know You Rider’. The band floats with a typical 1973 feathery sweetness, bouncing from winter blossom to blossom and displaying with a delicate heaviness. The midsection segue discovers Garcia springing to the surface with tightly coiled curly ‘q’s’, sprinkling the melody with playful luminescent quotes. The jam slips with enchantment into the ‘Feeling Groovy’ theme, before arriving at ‘Rider’ just on time. The other highlighted first set rendering is of a compact ‘Truckin’/’Stella Blue’ that while fenced in still spotlights a stilted jam out of ‘Truckin’ that cuts corners sharply and disorients with its gradual disintegration into ‘Stella Blue’. ‘Truckin’ is and would be capable of much more improve, but here in its first set position acts as a nice leg stretching exercise while still featuring unique passages. The ‘Eyes of the World’ is the centerpiece of the night and acts as the jam vehicle for the evening, opening the second set and featuring the heaviest dose of jamming. This ‘Eyes’ surpasses 20 minutes and is littered with Phil Lesh detonations, drones and discoveries which at points diffuse the melody into sunny fractals, only to be held together by barley visible threads of sound. The verses of ‘Eyes’, like the songs preceding it on the recording are beautiful and sung with great investment by Garcia. After two scintillating Garcia solo spots the band begins to undress the framework of the song. A militant march through the ‘Stronger than Dirt’ theme blinds the eyes with Billy K’s skipping and shimmering cymbal work. The jam falls apart momentarily when the licks decompose and begin to overlap in the bands enthusiasm. The jam teeters humorously on the edge of destruction, before an on stage yelp can be discerned. The yelp awakens the beast and journey continues as Garcia and Godchaux walk into a room with a sticky floor. 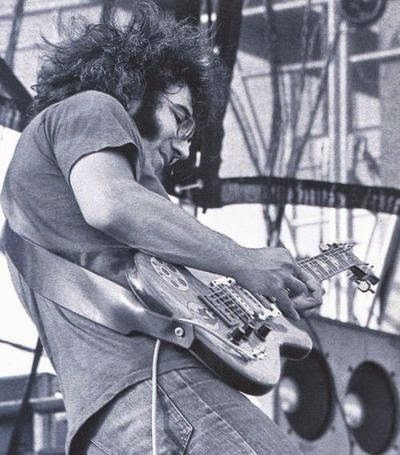 The band tries to steady themselves with a newly unearthed Garcia riff that starts to coagulate the respective elements of the group. All bets are now off as a new musical form is being developed in real time. After thirteen minutes Lesh begins to rattle the foundation of the venue and cracks and fissures start to become visible. Garcia and Godchaux scurry from the deafening noises like electronic mice while looking for clandestines corner to hide in. Lesh, as he has been throughout the performance must have had his hands in the backstage cookie jar. His playing is out of hand. He molds his bass notes into a pliable sound form that initiates a shifty and morphing layer of bedrock in which Garcia sleepily drapes clean tone statements. The sounds become something greater than the instrumental mediums. A moaning sonic beast comprised of sonic electrodes thrashes around the venue and through the ‘rock room’. Soon, a feedback dance takes place in the outer limits taking form as large unknown objects brush against each other weightlessly soon triggering a wash of sound. Lesh slams his bass into an unmovable planetary body causing a disruption of a volcanic magnitude. Kreutzman uses the door blown open by Lesh to enter into the webby fabric of space dissolving into the mix with a crisp series of snare strokes. Like an ice cube thrown onto smoldering rock, the jam liquefies, filling the crannies and pock marked landscape. Garcia and Godchaux team up for dazzling array of jams that become form long enough to expose trail markers before deconstructing into a Garcia flip book of alternative communications. Billy and Keith link arms to make a ring and contain the mellifluous mixture being stirred by Garcia. Still parts squish out from the edges. Lesh quits with his aggressive attitude and sits down, approving Garcia to continue his descent into madness. A ‘tiger’ almost spills over the top but is held in restraint by Garcia who continues to pump his pedal into a toothy series of growls and a number of waxy bulbous drips. An aura of strangeness falls onto the stage like morning culminating the previous excursions. 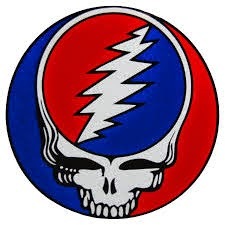 Before I know it Weir has strummed the introduction to ‘Sugar Magnolia’ which trudges out from the thick sonic web of ‘Eyes’, stumbling slightly before Lesh turns on the faucet, permitting the groove to flow freely. ‘Sugar Magnolia’ picks up steam nicely, as all members fall into place resulting in a floral rendition that soon leads into the unusual segued placement of ‘Going Down the Road Feeling Bad’. While this second set is very short due to the circumstance surrounding the late start of the concert, the result of this fact is a unique series of song placements as well as the cool jam hidden in the recesses of ‘Eyes’. ‘GDTRFB’ has a nice leisurely opening that navigates the changes carefully before slowly climbing steps that lead to an all time version. A plethora of bubbly rock waves lap at the shore with the band raving up into a well deserved conclusion. Killer rock, and a unique pairing of Suga' Mags and 'GDTRFB'. ‘Casey Jones’ leaves the station slowly, caught in the dust spun up from the tires of ‘GDTRFB’. A chunky funky version that alternates between sleepy and speedy but results in a rolling good time closer. Garcia gets the band to push through the bumps finally cresting the hill and starting the long roll without breaks toward the finish. The resulting crowd approval audible on the soundboard proves that the band, in spite of the late start was still able to deliver in a big way. Dead fans are familiar with the wealth of mind melt material to be found in the volumes of the Fall of 1973, so this snippet of aural magic should come as no surprise. While somewhat obscured by the massive trees that surround it, there is still moving music waiting to be discovered for those willing to push aside the brush and search. Take a trip back to 1973 when a normal night by Grateful Dead standards could still move musical mountains and blow collective minds.